Thank you to all the poetic minds out there! We had some very imaginative entries. Random.org came up with #s 18, 44 and 48 and each will win a copy of Feeding the Whole Family. Wowie zowie. We really enjoy bringing you these contests. There’s more to come. Some great Chico duffel bags, kale t-shirts, Natural Lifestyle bakeware…stay with us! CONTEST CLOSED. THANKS FOR PARTICIPATING. Activities that engage the mind, such as reading and performing crossword puzzles, seem to help offset the early symptoms of dementia. I may be a bit dotty, but I can still write a haiku! In the spirit of keeping the mind nimble, we bring you our FOURTH ANNUAL HAIKU CONTEST. We’re giving away THREE copies of Feeding the Whole Family in celebration of our 3rd anniversary (we launched Cookus Interruptus in 2008). A huge percentage of the recipes used in our videos (and much more) can be found in Cynthia’s cookbook. Besides writing and video-making, Cynthia is core nutrition faculty and director of the culinary program at Bastyr University. The foreword is written by Mothering Magazine’s Peggy O’Mara and Cynthia’s cookbook is endorsed by Marian Tompson, founder of La Leche League, and author Heidi Swanson (101 cookbooks). Each recipe shows you how to adapt part of the delicious dish for baby. Already have a copy? Folks tell us that Feeding the Whole Family makes the perfect gift for new parents – win one to use as a gift! 1. Be a subscriber of Cookus Interruptus Not a subscriber yet? Type your email address in the subscribe box right up there on the right above the blue navigation box. There’s also a place to subscribe on our home page (upper left). 3. Write a haiku ( 3 lines, 5-7-5 syllables). The topic is cooking. Tell us something you enjoy or find challenging about cooking in the form of a haiku. Doesn’t have to make sense or be spectacular. Just give us 17 syllables. Here’s help if you’re not sure what a haiku is: Write-a-haiku. Type your haiku as a comment to this post. 4. Contest ends at 5pm on August 5th . Check your email on August 6th. The winners will be chosen by random.org. If you don’t respond to your “winner” email within 24 hours, we will choose a new winner. In a time when families are dealing with two careers, longer working hours and children with numerous extracurricular activities, the fate of the shared, home cooked, family meal seems in jeopardy. But the fact is that many families juggle commitments in order to eat together as often as possible. We know that eating meals together increases the enjoyment of the meal, solidifies family bonds and encourages communication about the day’s activities among family members. If we are willing to make the extra effort required to share a common meals, then our lives are richer as we break bread together; family solidarity is built. Children love the predictability of positive family events that occur daily and shared family meals are very beneficial to them. Family dinner conversation helps expand children’s vocabulary skills and increases success in learning to read. Mealtime is also where children learn many of their social skills including table manners and the art of conversation. Much of family history relating to culture and race is passed on to children by parents at the dinner table. Food rituals may illuminate a family’s ethnic heritage when traditional meals are served. These things help stabilize the child’s identity as a member of a particular group. Studies show that children who participate in regular family meals and other rituals have more emotional resilience to help them handle stress and chaos in other areas of life. Marooning babies in high chairs or plopping children in front of the tube while they are being fed robs them of what could be an otherwise enriching experience. If all that doesn’t convince you, consider this. The National Center on Addiction and Substance Abuse at Columbia University released a study showing that teens who regularly dine with their families have a smaller chance of smoking, drinking alcohol, and using drugs; and they also earn better grades in school. Set a firm foundation of shared meals when your children are young. There are also nutritional advantages to eating meals together. Children who dine without parents or siblings eat fewer servings from the necessary food groups. This is partly true because when parents are present they can monitor a child’s food intake, ensuring nutritional adequacy. Eating together also gives parents the opportunity to model good eating habits such as choosing healthy foods, chewing food well, and stopping when full. Keep conversation pleasant at mealtime. If you have touchy subjects to bring up with your spouse or children, don’t do it while dining. Unpleasant news will tighten the stomach, take your mind off the enjoyment of eating and the potential benefit of the meal will have been wasted. What are some of the rituals you practice to keep your family meals fun and lively? The USDA pyramids and guides sometimes confound me. The original intent of the creation of the USDA – to support the health of US citizens while simultaneously supporting the growth of food industries (particularly dairy and meat) – was worthwhile. But as the years have passed, the support of the latter seems to have overtaken the race of good intentions. The compromised information doesn’t give me a clear picture of what to make for dinner. Recently a few folks have written and asked for a copy of the graphic from Feeding the Whole Family that captures my idea of a balanced meal. I love that Lisa from Wisconsin referred to it as the ‘wonderful octagon”. The graphic is a colorful interpretation of the one in my book which was colorized for the September/October 2008 Mothering Magazine article called “Envisioning a New Balanced Meal”. New research has found that activities that engage the mind, such as reading and performing crossword puzzles, seem to help offset the early symptoms of dementia. In the spirit of keeping the mind nimble, we bring you our 3rd annual haiku contest. Write a haiku ( 3 lines, 5-7-5 syllables) that describes your experience of once hating a certain food that you now love (or vice versa) . Wow. I know. Talk about distillation. You can do it. Here’s help: Write-a-haiku. Type your haiku as a comment to this post. Entries due by 6pm September 14th. This is a jury-ed contest (not a random drawing). At least 5 of us will read all and give our top three picks. The 3 haiku with the most votes will win. We will pick THREE WINNERS. A copy of Feeding the Whole Family mailed directly to your door. Winners will be notified by email on September 15th and will have 24 hours to reply to the “winner” email ( so check your email on the 15th!). If there is no reply, we will choose another winner. These delicious and fun-to-make cookies are perfect with afternoon tea. Variations in flavor can be made by substituting different nuts and jams. I love cherry preserves or blackberry jam too! Preheat oven to 350 degrees F. Grind almonds into a fine meal in a small grinder or blender. Combine flour, almonds, baking powder, zest and salt in a mixing bowl; set aside. In a separate bowl, mix butter, syrup, and extracts together. Add wet ingredients to dry and mix well, kneading a little. Form dough into balls and flatten to make circles. Place on lightly oiled cookie sheet. Indent each cookie with your thumb or your child’s thumb and put ½ teaspoon preserves in the imprint. Bake 15 minutes, until edges turn golden. 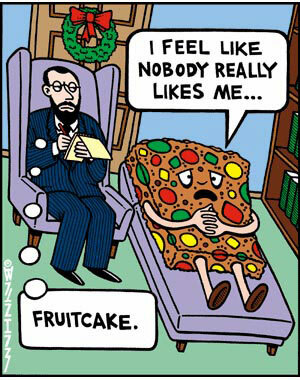 What’s your fruitcake story? Submit by December 16th. Must 250 words or less. If the word count is too high, you’ll be eliminated. Winner receives a copy of Feeding the Whole Family for Christmas. When I was in college at Wichita State University, every Christmas Eve the theater majors would go out caroling. There were some decent voices and it sounded pretty sweet. We often went to Max and Barbara Schaible’s house and one year Max wasn’t there but Barbara was and she graciously gifted us with a fruitcake. It was in my hands. Later in the evening (okay we sometimes drank some wine between houses) we were at someone’s house I didn’t know. They were having a party. One of the guests, who stepped forward, was Max Schaible and without thinking I walked up to him after Good King Wenceslas and, smiling, handed him the fruitcake. He was charmed. For some unknown reason, even later, we decided to drop by the Schaible’s house again and Barbara seemed very confused as to why Max had come home bearing the fruitcake she had given us. Obviously I had no explanation. OUR WINNER IS Jacqueline! Loved the line”Funny how nostalgia makes things taste better.” Indeed. Happy Holidays.